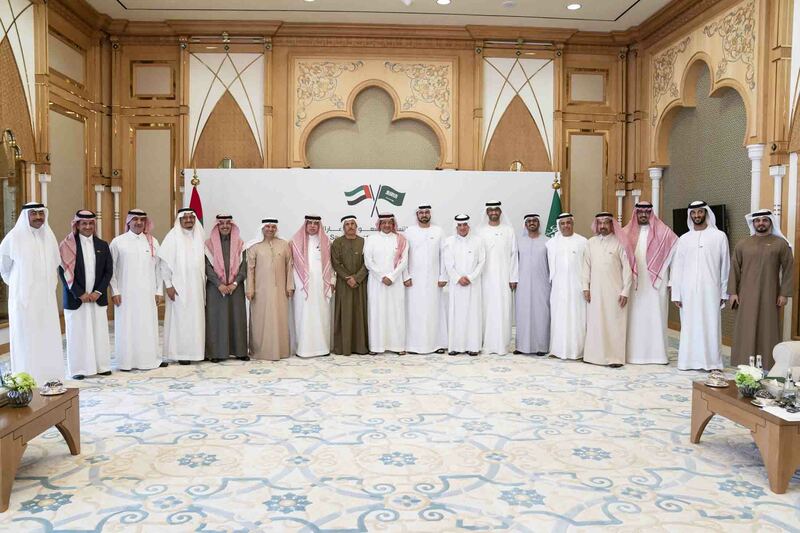 ABU DHABI, 19th January, 2019 (WAM) -- The Executive Committee of the Saudi-Emirati Coordination Council held its first meeting in Abu Dhabi with the participation of all 16 members from both sides to follow up on the execution of the joint initiatives outlined in the Strategy of Resolve. The committee, headed by Mohammad bin Abdullah Al Gergawi, Minister of Cabinet Affairs and The Future, from the UAE side, and Mohammed bin Mazyad Altwaijri, Minister of Economy and Planning, from the Saudi side, announced the launch of seven strategic initiatives that reflect the bilateral integration in the fields of services and financial markets, tourism, aviation, entrepreneurship, customs and security, among others. The committee is tasked with ensuring the implementation of the joint initiatives. The Saudi-Emirati alliance is one of the strongest economic alliances in the world. The combined sovereign wealth funds of the Kingdom and the UAE are ranked second in the world. The two countries rank eighth globally in terms of exports of goods and services according to the World Bank data. The market capitalisation of listed companies in the two countries is the 17th globally, and the two countries have an oil reserve accounting for about a quarter of the world's total stock, which amounts to 24.3 percent. The seven announced initiatives are: Saudi-Emirati Pilot cryptocurrency The first of its kind joint pilot cryptocurrency was launched during the meeting. The cross-border digital currency will be strictly targeted for banks at an experimental phase with the aim of better understanding the implications of Blockchain technology and facilitating cross-border payments. The virtual currency relies on the use of a distributed database between the central banks and the participating banks from both sides. It seeks to safeguard customer interests, set technology standards and assess cybersecurity risks. The project will also determine the impact of a central currency on monetary policies. Facilitated flow of traffic at the entry ports This initiative facilitates the flow of traffic at the entry ports between both countries and at customs outlets through the adoption of the fast track system and the application of the "Authorised Economic Operator" framework. The initiative will contribute to smoother operations between customs and commercial establishments, and facilitated trade between the two countries. The number of companies listed in the Authorised Economic Operator is 41 from Saudi Arabia and 40 from the UAE. Joint platform to support SMEs The establishment of a joint platform that allows registered Saudi and UAE SMEs to benefit from the government procurement allocations from both countries and to compete on terms of reciprocity on federal government procurements. Financial Awareness Programme for Children The Financial Awareness Programme for Children aims to promote the basic financial concepts youngsters between 7 and 18 years old. The programme will enable them to simulate the business world to learn about saving and smart spending, as well as understand the culture of entrepreneurship through customised training courses. A joint exercise to test the supply security system The joint training exercise is aimed at testing the supply chain security systems in the vital sectors of the two countries during a crisis or natural disasters, and to identify the points of improvement and develop an implementation plan accordingly. The joint exercise will contribute to building a mechanism for direct communication and control of risks between the relevant units in both countries during emergency times, as well as the sharing of expertise, knowledge and experience on supply chain security and risk management. Enhancing the travel experience of People of Determination The initiative seeks to enhance the experience of travellers from the People of Determination category by ensuring the compliance of disabled-friendly airports in both countries. The initiative will also standardise travel procedures and regulations for accompanying members. Other elements outlined in the initiative include the training of airport crew to implement adequate standards that guarantees People of Determinations all their rights. Common Market for Civil Aviation The Saudi-Emirati common market for civil aviation aims to achieve comprehensive integration and cooperation in the civil aviation sector in vital areas including air navigation, safety and security, and investigation of air accidents. The common aviation market is considered to be an advanced stage of economic integration as both countries combined have the largest economies in the region. During the meeting, the Joint Supply Chained Security Cooperation Programme was signed between the Kingdom and the UAE. 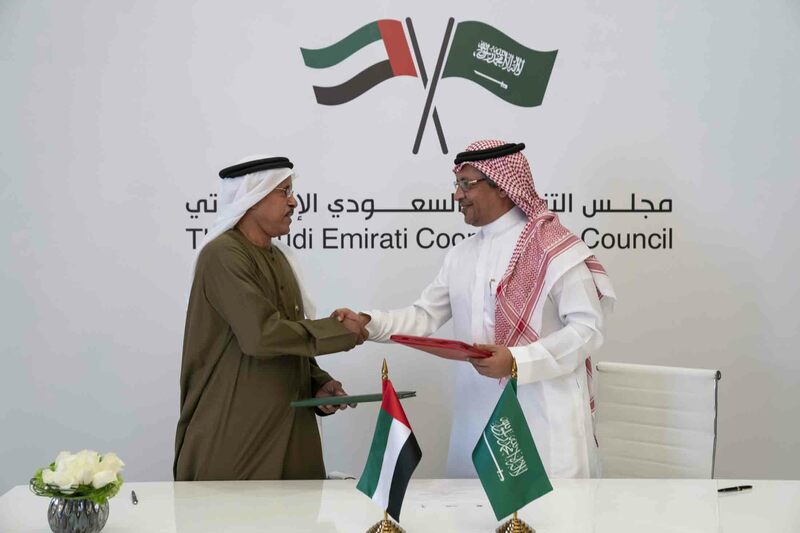 Saif Sultan Mubarak Al-Ariani, Secretary General of the Supreme Council for National Security, signed on behalf of the National Emergency, Crisis and Disaster Management Authority in the UAE, and Mohammed Al Tuwaijri, Minister of Economy and Planning on behalf of the National Risk Unit in the Kingdom of Saudi Arabia. The programme aims to enhance the coordination in the areas of security and safety and to enhance readiness in cases of crises and disasters. The meeting of the executive committee of the Saudi-Emirati Coordination Council was concluded by a visit to the Louvre Abu Dhabi and to the "Roads of Arabia: Archaeological Treasures of Saudi Arabia" exhibition which showcases the vibrant archaeological history of Saudi Arabia and the region.